The bi-regional partnership in STI between the EU and LAC has evolved significantly and visibly during recent years. Initiated by the EU-LAC summit in Rio in 1999, the bi-regional STI dialogue has been developed and consolidated both on political and operational levels. This process finally converged in the adoption of the “Madrid Action Plan 2010-2012 - Towards a new stage in the bi-regional partnership: innovation and technology for sustainable development and social inclusion.” This was adopted by the European Union – Latin America and Caribbean Summit in Madrid, 2010. The aims of the Action Plan are mainly to support bi-regional cooperation programmes and initiatives, including ‘south-south’ cooperation and ‘triangular’ cooperation. The Plan also endorsed the development and implementation of a JIRI (Joint Initiative for Research and Innovation). The mandate of the JIRI includes actions to “establish regular bi-regional dialogue on science, research, technology and innovation to consolidate ULAC cooperation and to update common priorities, encourage mutual policy learning and ensure the proper implementation and effectiveness of cooperation instruments”. A fifth cross-cutting group co-coordinated by Mexico and Portugal looks at funding instruments, opportunities and good practice. On 4th March 2012, a meeting of the European Union-Economic Community of Latin American and Caribbean countries SOM (EU-CELAC SOM) took place in Concepción, Chile. The aim of this meeting was to review the state of implementation of the JIRI roadmap and to report on the progress achieved and longer-term perspectives to the Summit in Santiago de Chile at the end of January 2013. Following the working groups’ recommendations to ensure prompt action on the opportunities identified and to joining forces between participating countries and opening up to additional countries, the S&T senior officials agreed in Chile to arrange a meeting to bring together research and innovation funding agencies and programme owners of the interested countries in order to identify the most suitable mechanisms for implementing the concrete actions of the JIRI. Hence, with the aim to associate EU and LAC research funding agencies with the JIRI, the European Commission invited senior representatives of funding agencies from both regions to a joint meeting in Brussels in November 2012. The 19 participating agencies were informed about the priority objectives and actions of the JIRI and decided to sign a Joint Statement expressing their willingness to support the JIRI future activities. The participants recommended the establishment of two more SOM working groups – one on “Health” and one on “Cooperation in research capacity building” for consideration at the next EU-CELAC SOM in April 2013. At the meeting of the funding agencies, the SOM working group on “cross-cutting issues” presented an analysis of the current status of bi-regional S&T cooperation, outlining existing framework conditions and instruments and formulating the need of implementing concrete and efficient joint initiatives – making use of and combining existing instruments and creating new ones. There was general recognition among the funding agencies that the bi-regional cooperation offers high added value and that the exploitation of opportunities within the existing national, regional and bi-regional funding schemes is both possible and desirable. At the EU-CELAC SOM in April 2013, the four thematic SOM working groups presented their recommendations for future joint activities within the JIRI. These recommendations included suggestions for capacity building measures, observatories, creation of thematic networks, opening up of national and regional structures, networks and programmes and concrete joint funding actions. The SOM delegates decided to implement a new working group on “health”. The Commission clearly stated, that the activities of the SOM and its working groups will be supported by the INCO-Net project with Latin America and the Caribbean Region (ALCUE NET), the BILAT-projects with Argentina, Brazil, Chile and Mexico and the future ERA-NET with CELAC. The diagram below provides an overview of the working group structure developed to support implementation of the JIRI. 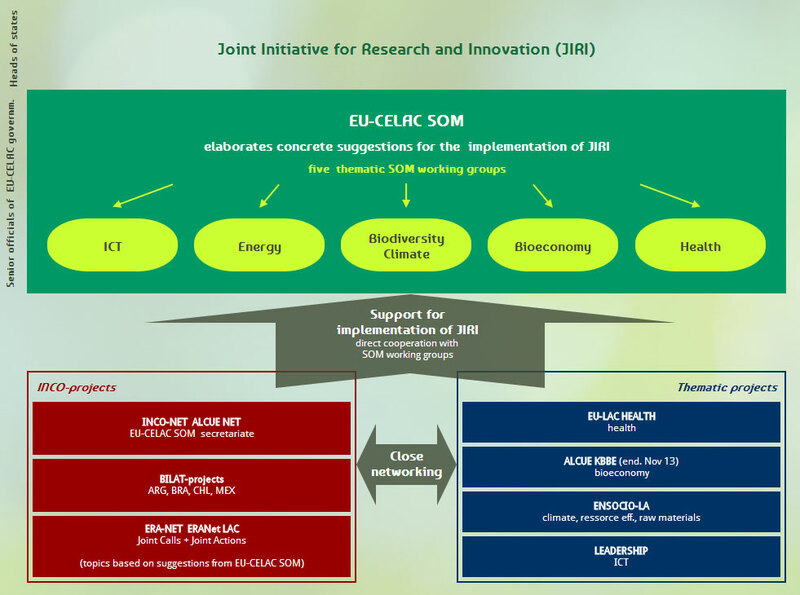 The JIRI is (currently) implemented via five thematic SOM working groups, addressing ICT, Energy, Biodiversity / Climate Change, Bio-economy and Health. To help identify and address research priorities in each of these working groups, a series of cooperation and thematic projects have been funded: the INCO-NET ALCUE NET generally supports all SOM working groups with the exception of Health, which addressed via the EU-LAC HEALTH project. 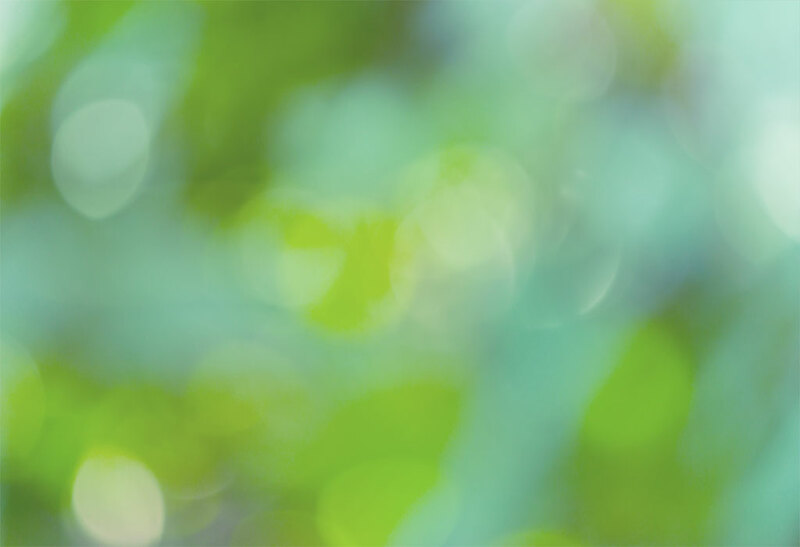 The ENSOCIO-LAC project is one of the thematic projects directly addressing research collaboration under the EC FP7 priorities of Climate Action, Resource Efficiency and Raw Materials. The ERA-NET with Latin America and the Caribbean (ERANet-LAC) is supporting implementation of the JIRI by initiating joint bi-regional actions. It implements two Joint Calls for bi-regional research projects – addressing topics and issues of priority arising from the SOM working group process. This also includes recommendations for research actions arising from the ENSOCIO-LAC project, fed directly into the SOM Biodiversity and Climate Change working group. The ENSOCIO-LAC project has close ties with both the ALCUE-NET and the ERANet LAC project.